Thanks to those of you who offered suggestions for what to do with my wing back chairs in the new living room get-up. If you didn't feel like helping out that's OK, but I'm considering all options so there are no unwelcome suggestions. 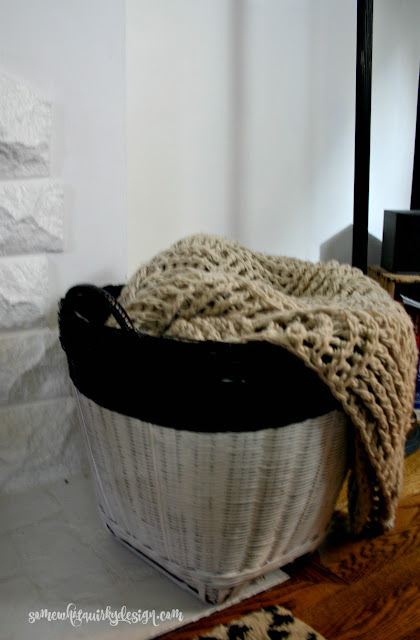 One of the things that I did for the color transition in the living room was to paint a couple of large baskets that we'll be using for storage for pillows, throws, and such. 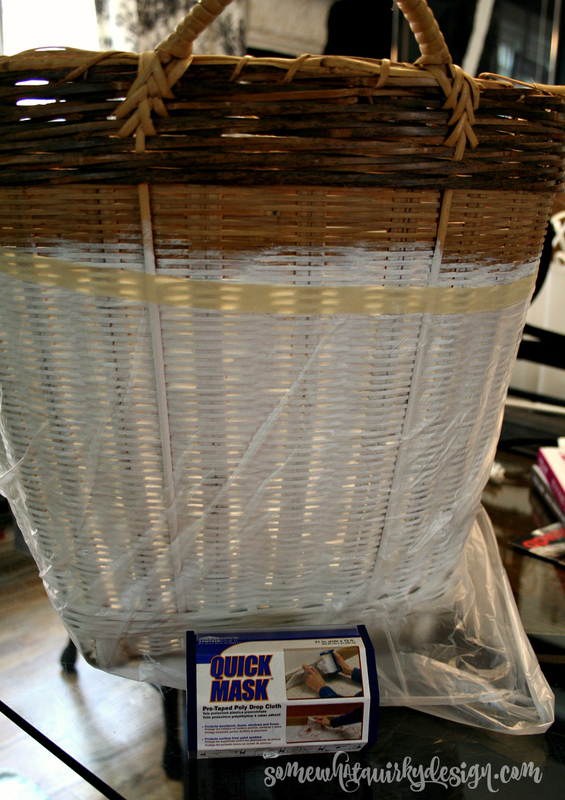 I was going to be painting two colors - black and white - on each basket. The white would be painted by hand, but the black would be spray painted. 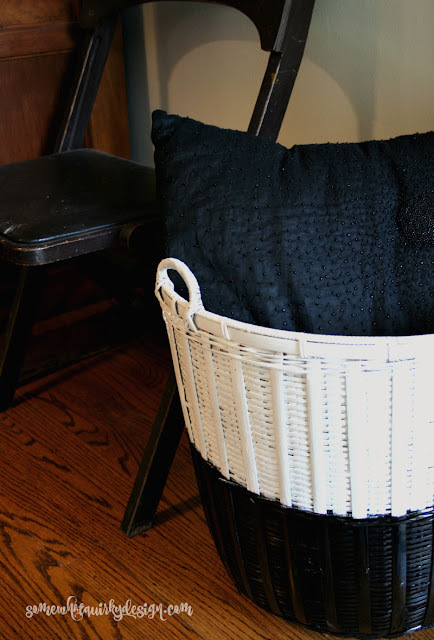 I started out by painting the white areas of the baskets with Reclaim Paint in BRIGHT WHITE . Reclaim paint is a primer, paint, and sealer all in one. It is great to use when you don't want to do much prepping or apply a finish to your paint. If I ever decide to paint my kitchen cabinets again, this is the paint I will use. It is really easy to use and the finish cures rock hard. The black paint I was using was Rust-Oleum Protective Enamel Spray Paint in Gloss Black. If you've ever read one of my spray paint project posts you may know that this is my FAVORITE spray paint and I always have a can or two of it hanging around. My only gripe about it is that it doesn't come in all the colors that the other Rust-Oleum paints come in. OK. Now here comes the really cool part. I went down to the basement to check out my tape collection. I had painted white first, because it was nighttime and I was painting indoors, and therefore was going to have to thoroughly cover the white parts of the basket when I used the spray paint. 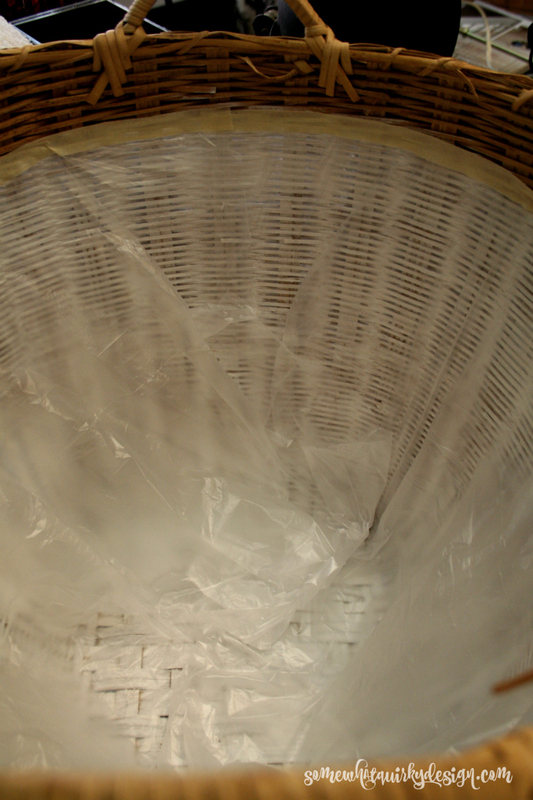 I thought I would have to tape a trash bag to the tape then apply it to the basket. When I opened the paint drawer THIS popped up . . . I had picked this up from the HomeRight booth at Haven - probably the first year I went. It was sitting in the tape drawer, just waiting for the right occasion to be used. This was it. 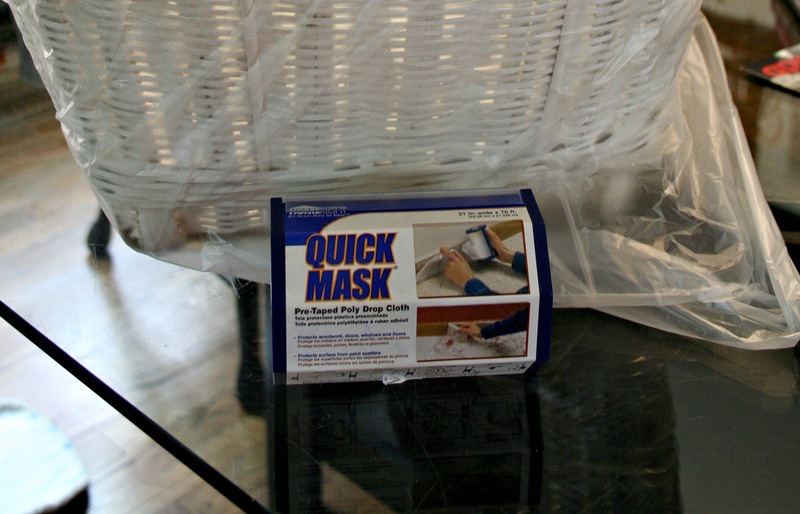 HomeRight Quick Mask is a roll of pre-taped protective plastic that keeps paint drips and spatter off of adjacent surfaces. And I might add that Quick Mask ROCKS!!!! The paper draped down and protected the entire basket from the spray paint. Best of all, it did not pull off ANY paint when I took it off the basket. The only thing I would change is to exaggerate the angle of this one. It's not as pronounced as I would have liked. I guess you can tell this one got photographed before the wall got painted black! I think my $2s worth of baskets look pretty good all slicked up in black and white! And I really like having a place to put my blankets and pillows. The room is so small that I need to have a place for those things to hang out and not clutter up the room. I have enough other stuff to do that! Disclosure: This post contains affiliate links. The tape I used was also provided by HomeRight (a give-away at Haven). HomeRight did not ask me to write this post. The product was provided to expose me to more of their product line. I just happens that I thought it was the best thing since sliced bread! I will be looking for that product as I have some baskets to paint myself. I tried taping them off and every time the lines were so wavy I took tape off again, lol. Waiting for a brain wave of inspiration to hit before I try again. 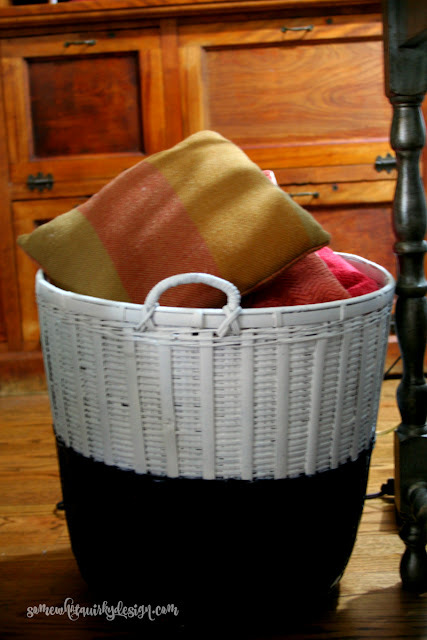 Even wavering to painting all one color instead of trying to be snazzy like your baskets turned out. These particular baskets are for our toiletries in our bathroom since we don't have a linen closet and area under sink is too small. 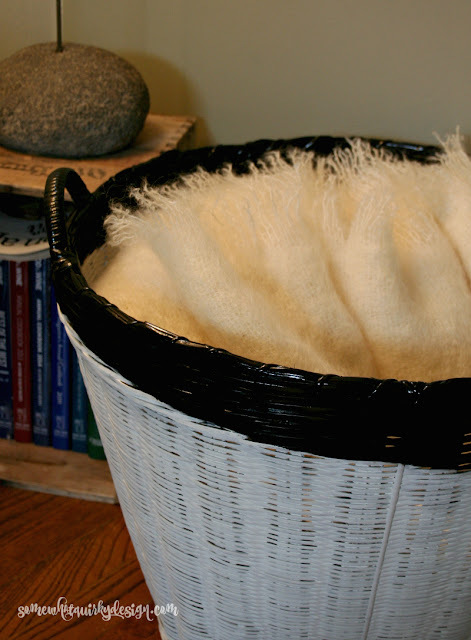 I did see a photo the other day that might work, towels were rolled up to be put in baskets hanging on wall, think that might work. We use a 9 cubby stand to store our bathroom needs in our master bath. Our home is a single wide mfg. home 16x80 with bathroom being at very back end of house and our room is next to it. We've been slowly trying to do little changing of things since we're not always too happy with what we inherited when we bought this place. One good thing is it's out in country, has 1/2 acre and we can have our chickens and nobody complains about our dogs' deep voice. They're such lovely young ladies, all 5 of them which we inherited from one of our daughter's neighbors when they had to move to Denver, no chickens welcome there. Sorry I digress. I Love changing things for my purposes even tho hubs questions my ideas quite too often. Tuff, it's what I want to do. Have to be very firm with him as he tried to do things his way too often. Happy daze to you and yours. Love your baskets, I need to get some big baskets like yours.